1: What’s the purpose of the ST Evaluation Program? 2: Who can submit videos in the ST Evaluation Program? 3: Who will evaluate the videos, and can I choose an evaluator? 4: I’m new in ST Evaluation, where do I start? 5: I’m very advanced in ST, do I have to start in Grade 1? 6: When I passed Groundwork – Grade 1, can I continue with Groundwork – Grade 2? 7: I don’t ride my horse, can I still send in videos for evaluation? 8: Can I use different horses for different Touchstones? 9: Can I use a schooled horse for the Touchstones? 11: Do you need a proper arena to do this, or can it be improvised? 12: Is it OK to film on ground that is not perfectly even? 13: Do I need a camera person? 14: Can I submit more videos at a time? 15: When do I get feedback? 16: How to deal with the feedback? 18: How long is a Touchstone valid? 19a: When my video is a pass, do I get a certificate? 19b: When my video has to be resubmit, do I lose my free Touchstone? 20: How many stars is required to continue? 21: How can I join the ST Evaluation Facebook Group? 22: Can I share my evaluations with other Mastery Students? 23: Where can I find evaluations from my fellow Mastery Students? 24: Where can I find the ‘how to’ information? 25: How does ST Evaluation 2.0 relate to the ST Evaluation 1.0, the Pilot Try Out (2014-2015) ? 26: How do I qualify for the ST Instructor Program? 27: Is it possible to do touchstones on clinics instead of submitting online? 28: What if I don’t want to have my touchstone visible on a public YouTube video? 29: What if I did my Touchstones before 1/1/2016? Can I update them to the 2.0 standard? If you still can’t find the answer, please contact [email protected]. ♦ 1. What’s the purpose of the ST Evaluation Program? To achieve “mastery” in Straightness Training, self-evaluation is critical. Self-evaluation is about knowing where you are and where you want to go. It gives you a pathway for making structured and consistent progress. The ST Evaluation Program is intended to help in your journey towards mastery in all five Training Pillars. The ST Evaluation Program is NOT intended to be used to compare yourself to others or to compete with others. It’s about comparing yourself to a standard and your own progress. It’s about knowing where you are and what to do next. It’s about becoming a better version of yourself. 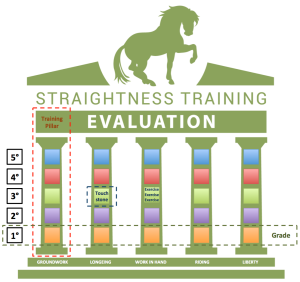 The structured ST Evaluation System is designed to evaluate and measure your level of skill and that of your horse. Through assessment of predefined exercises, you can demonstrate your ability to perform the ST exercises that are outlined in ST Mastery. All requested exercises are presented in a script illustration video, so you know the exact format of the requested evaluations. ♦ 2. Who can submit videos in the ST Evaluation Program? The Evaluation program is meant as a way to give feedback to students on how they put the theory into practice. And without the theory, the practice will always be uncertain, as François Robichon de La Guérinière already said centuries ago, and we want to avoid students performing ‘look-a-likes’. So students need to know the clear ‘why’ behind what they are doing and need to be aware of the full spectrum of essences behind all ST training components, exercises, techniques, strategies, and concepts, before they start to submit Touchstones. Therefore, to successfully submit Touchstones, the theoretical background of the encyclopedia of Straightness Training in ST Mastery is a prerequisite, a must. Our former Home Study Course (HSC) only partially contains the theory for Grade 1, and it doesn’t contain the theory for Grade 2 and higher, and because ST is about ‘Think First, Act Later’, the HSC is not suitable for preparing a student completely for all grades. Therefore a student who wants to submit videos in ST Evaluation needs to be a member of the ST Academy in order to have access to the theory of the Mastery Entry Course or full Mastery Program to set him/her up for success in the ST Evaluation Program. So to be short: the ST Evaluation Program is only available for ST Mastery Students. I you want to become a Mastery student, just contact [email protected] so we can get you sorted. ♦ 3. Who will evaluate the videos, and can I choose an evaluator? A team of evaluators that are members of Marijke’s Straightness Training Instructor Network (STIN) will evaluate your videos. Grade 2 ST Instructors Dora Hebrock (USA) and Wendy Poore (UK) who evaluate Groundwork and Longeing Touchstones at the level of Grade 1. Grade 3 ST Instructors Roz Richmond (UK), Anouk Wienia (NL) and Kim Steutel (NL) who evaluate Touchstones in all five training pillars on the level of Grade 1. Grade 3 ST Instructors Carolin Moldenhauer (Germany) and Miriam Sherman (Germany) who evaluate Touchstones in all five training pillars on the level of Grade 1, and Grade 2 under close supervision of B-Instructor and STE Supervisor Zaneta Georgiades. Grade 4 ST Instructors Rebecca Gilbert (UK) and Zaneta Georgiades (South Africa) who evaluate Touchstones on the level of Grade 1 and 2, and Grade 3 3 under the close supervision of Marijke. Marijke evaluates all Touchstones at the level of Grade 4 and 5. Supervisor Zaneta Georgiades assigns all submitted Touchstones and makes a balanced spread over all evaluators. In this assign process, she takes into account the country of the student, the pillar and grade of the student, and who has evaluated previous Touchstones of this student. For the time being, it is not possible to express a preference for a specific evaluator. From left to right: Rebecca Gilbert, Zaneta Georgiades, Carolin Moldenhauer, Miriam Sherman, Anouk Wienia, Roz Richmond, Marijke de Jong, Kim Steutel, Dora Hebrock, Wendy Poore. ♦ 4. I’m new ST Evaluation, where do I start? You will start in Groundwork at Grade 1. So everybody’s first ST Evaluation ever will be Groundwork – Grade 1. This Touchstone will carefully prepare you for all the other Training Pillars: Longeing, Work in hand, Riding, and Liberty. Check also the ‘7 Steps To Set You And Your Horse Up For Success!‘ post in the Support Section. ♦ 5. I’m very advanced in ST, do I have to start in Grade 1? In every Training Pillar, you will start with Grade 1, no matter if you are a beginner or an advanced rider. And each Training Pillar must be built up with sequential Touchstones, starting at grade 1, followed by 2, 3, 4 and then 5. ♦ 6. 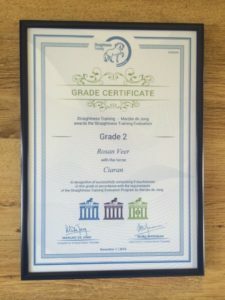 When I passed Groundwork – Grade 1, can I continue with Groundwork – Grade 2? You can do an Evaluation for the next Grade in Groundwork and continue with Groundwork – Grade 2. Or you can start in the next Training Pillar at Grade 1, Longeing – Grade 1. You can also start with Work in hand – Grade 1. Or with Liberty – Grade 1. You can choose your own path; however, with a 1-star performance, it’s a wise strategy to stay in the same pillar to integrate the tips you gained and to resubmit the same Touchstone in order to get a better star rating. This way you see the Touchstones as ‘lessons’ and not as ‘tests,’ and that’s the real purpose and value of the ST Evaluation Program. Because your chances on a proper result in the second grade might be reduced if you have only a one-star performance in Grade 1, ending up with not enough solid foundation. The key to real beauty and excellence lies in really mastering the fundamentals. Only when you have a solid foundation, then you will be able to build a real ‘cathedral’ that can stand the test of times. When receiving a one star, most students are happy and progress with the next challenge and Touchstone. But you will discover later on, that in order to reach higher levels, you need a foundation that is stronger than a one-star result. For example, if your haunches-in on the circle in walk is not really good, then that will haunt you in the canter pirouette until you decide to step over your ambitions and disappointments and go back to the basics in walk. That is why it is so crucial and essential that we put so much energy and focus on the fundamentals in ST. So actually when you fail to pass a Touchstone, or when it’s ‘only’ a 1-star performance, that is actually the best value you can get for your efforts. Looking deeply inside, working with the feedback you got, grinding it out until it’s really a great foundation, that will produce the best way to real artistry. ♦ 7. I don’t ride my horse, can I still send in videos for evaluation? If you don’t ride, or have an unrideable horse, you can skip the Riding Touchstones. You’ll receive Touchstone certificates for the pillars you successfully submit. However, a grade certificate can only be achieved if all pillars in a grade have been successfully completed. ♦ 8. Can I use different horses for different Touchstones? To achieve ‘mastery’ in Straightness Training you should strive for doing all Touchstones with the same horse. However, if your main ‘master’ horse gets injured or retires, and you have to change horses, you could bring your new horse all the way up to the Grade you reached with the former horse by using the regular and logical order of gymnastic ST exercises. So you don’t need to be reassessed with a new horse. So you can bring the new one up to the Grades in the Training Pillars you had with the former horse, and from this level, you can continue with your Touchstones with your present horse. In the end, it’s about developing your training skills and about your learning on how to become an ST trainer. If you would like to start one or more additional horses besides your ‘master’ horse in the ST Evaluation program, because you would like to have this horse evaluated periodically too, you can either start from scratch with this horse – starting with Groundwork Touchstone Grade 1, if you would like the feedback to make sure you continue on the right path – or you can bring this additional horse up to the Grades in the Training Pillars you achieved with your ‘master’ horse, and continue from this level with your additional horse(s). However, to be able to graduate within a certain grade, it should be the same horse in all Training Pillars in one Grade. So all 5 Training Pillars in the same grade has to be performed with the same horse, and the horse has to be educated by the rider himself. So it’s not possible to use your best horse for Groundwork and another horse that is best at Liberty for Liberty. When you graduate, you have really experienced what all 5 training pillars give to each other and to the specific horse within a particular grade. ♦ 9.Can I use a schooled horse for the Touchstones? A horse that has been educated by another STudent or that already did touchstones with another STudent. A horse that has been educated by somebody else until a high level in a classical equestrian discipline. A horse that has been educated by somebody else until a high level in sports dressage. Because for sure you will also get valuable lessons from our evaluators for you and this horse. A horse where you are the one who taught the horse the ST exercises LFS, shoulder-in, haunches in, renvers, half pass and the pirouette to counterbalance the natural asymmetry. This includes young horses that you started with from the very first start of their life as a riding horse. This also includes older horses that already could do walk, trot, and canter, perhaps in an imbalanced way, or even with a lot of problems, so older horses that couldn’t do the ST exercises before you started training them. It’s recommended, that you use a Straightness Training cavesson. There is some flexibility, but in pursuing mastery in all five grades, one would never do Straightness Training without a cavesson. It’s an essential tool in Straightness Training. ♦ 11. Do I need a proper arena to do this, or can it be improvised? We have students from all over the world, and some of them work in fancy indoor riding arenas while others practice in an unlevel pasture. And both end up with great results! So just work with what you have, the most important thing is whether your horse is still able to perform the exercises. When you start filming your touchstones, you can always mark a certain rectangular area in your field with some cones or moveable poles and use that area. Because, you need a rectangular arena, paddock or pasture to work in, so it doesn’t have to be a real arena. You cannot use a small square paddock, sized for example 10×10 m or 20x20m. Also, you can’t use a round pen. ♦ 12. Is it OK to film on ground that is not perfectly even? Straightness training is all about balancing the horse, so if the ground is so uneven that it will bring the horse out of balance most of the time, it’s not the best idea. Your horse might for example experience more difficulties in shifting the weight back when going downwards. On the other hand, everybody has to do the best they can, with the resources they have. So everybody has to make the best of what they have with their facilities, and we understand that not everyone has perfectly level arenas. When you start filming your touchstones, you can always mark a certain rectangular area in your field with some cones or moveable poles (see FAQ #11) and use that area. As long as you keep the horizon level (so not having the camera tilted) and you and your horse are able to perform the movements too much difficulty then it is fine. ♦ 13. Do I need a camera person? With the video it’s important that we can see both you and your horse properly; otherwise we can’t evaluate you, and we can’t give you proper advice and feedback. It’s best when you and your horse fills up the screen completely and that you keep this shot as constant as possible. Therefore ask somebody to operate your camera, and use the camera’s zoom to film at the appropriate distance and zoom in/out gradually. The camera should be positioned in the middle of a short side of the riding arena and please use a tripod for camera stability. If you use a robot camera like Soloshot or Pixio, please make sure the zoom works fine. Now when it comes to Touchstones, only the ‘tight’ option allows evaluators to see details. But the ‘medium’ option is needed for longeing because the horse spirals out, just to keep both the rider and horse in the frame. However, the ‘medium’ option has a limited zoom, and we can hardly see any details on a video when this option is chosen. In the ST Evaluation Program, Soloshot can be used in the Groundwork, Work in hand, Riding and Liberty Touchstones when the ‘tight’ option is chosen. For the Longeing Touchstones, it’s best to find a camera person for tailor-made filming and proper zooming. You can tighten the zoom manually after setting the Soloshot 2 up – zoom in again after you’ve completed the walk and pairing. So some trial and error first, to fine-tune the footage with 2mm at the time, and once you figured out the best settings, feel free to submit your Touchstone. ♦ 14. Can I submit more videos at a time? It is recommended to submit only one Touchstone at a time. This way you can use the feedback from the Touchstone you have had assessed to improve the next one you submit. So take it one Training Pillar and one Grade at a time, and don’t submit more than one Touchstone simultaneously. If you submit more videos at once, it might be possible that the same ‘mistake’ is visible in all your submitted Touchstones, and that ‘errors’ should have been ‘corrected’ much sooner in the process, before it became an undesired and ‘hard to change’ habit. At all times, avoid doing a ‘home run’ where you submit all five free touchstones in the very last month of your 12-month–free-touchstone-period. ♦ 15. When do I get feedback? Until May 2018, we collected all submitted Touchstones in a particular month, and evaluated and gave feedback to all those Touchstones at the end of the successive month. Since June 2018, we will change our approach in giving feedback in a FIFO-way, which means, “first in, first out”. You can submit your Touchstones every day of the month. The first Touchstones submitted in a month are also the first touchstones to be evaluated. As soon as a Touchstone has been evaluated, the evaluation form with feedback will be immediately returned to you. We strive to send you the evaluation form in a minimum of 3 and a maximum of 30 days. Whether it will be 3 days or 30 days depends on the total amount of submitted Touchstones that is in the pipeline. No matter how many touchstones a month, the ST Evaluators take the time it takes to complete a thorough evaluation. The feedback is very detailed, will refer to specific seconds in the film, and the Evaluators not only look at the submitted Touchstone but previous ones as well to see the Bigger Picture in your development and give feedback in a compound and integrated way. This approach matches the actual flow of Touchstones, and we strive to go through the flow as smooth as possible with our team of ST Evaluators. There is no longer a monthly deadline when it comes to a submission (in the past this deadline was the 30 or 31 of the month). You can submit more Touchstones in a month – not simultaneously, but sequentially – and that helps you to keep momentum (in the past, you could only submit one Touchstone per horse in each Pillar/Grade). IMPORTANT: You can submit Touchstones independently from the email coaching. Of course, the email coaching suggests at a certain moment in time to submit Groundwork 1, and a few weeks later Longeing 1, but that is just a guideline. So to be clear: you can submit at any time, and you can submit at your own pace. And when it comes to your free touchstone(s), they are valid for 12 months. ♦ 16. How to perceive a Touchstone, and how to deal with the feedback? They can be viewed as ‘lessons’. And they can also be viewed as ‘milestones’. In general, when an evaluation says ‘resubmit’ or the result is 1-star, it’s best to perceive a Touchstone as a ‘lesson’, so you can widen, broaden, deepen your work with the tips and feedback you gained out of the evaluation. Only when there’s a 2-star result, we can perceive it as a ‘milestone’, where we have reached a solid base and created a stable enough platform to be able to continue with another Training Pillar or a higher Grade. Now people could also perceive Touchstones as ‘tests’, but if the purpose of learning is to score well on a ‘test’, we’ve lost the real reason for learning. A lot of people start yoga to become physically fit, but if fitness is all that we’re looking for, let’s go swim, play tennis, or climb a mountain. Of course, yoga gives us fitness, but not just physical fitness; it gives us fitness on all levels – also mentally, emotionally, spiritually. But the real reason why we should practice yoga is, that we want to become one with everything. It’s the same with doing ST. We don’t want to use our horse for ST, to score well on a test, or to get stars and stripes; we want to use ST for our horse, and to become one with our horse. 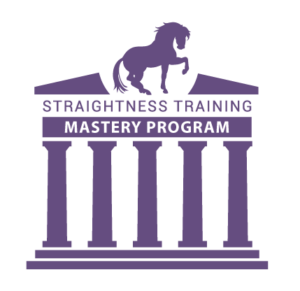 The Mastery Program gives you the Encyclopedia of Straightness Training, including a large set of ‘how to’ instructions – so the Mastery Program gives you the global ‘map’ with a set of concepts. The ST Evaluation Program is meant to help you fill in the details in your own ‘territory’. Because when putting the theory into practice, the devil is often in the detail. For example, if we look at golf: If you hit the ball 2 mm ‘wrong’ at the start it ends up 200 meters off track in the end! Or if we look at footings under a house: even 2mm of uneven setting is enough to cause cracks in masonry, tile, cement or plaster! It’s the same with horses: even 2mm off track in Groundwork Grade 1 is enough to cause cracks in Groundwork Grade 2, and in Longeing, Work in hand, Riding, or Liberty Grade 1! So with the help of the team of ST Evaluators, you can kill the monsters when they are little. Their feedback is meant to help you refine your skills with 2 mm at a time, to stay on track and to avoid getting off track. Another reason why the Touchstones are vital for a student’s progress is that most Mastery students study entirely on their own. And most of the time they are the only one in their own country (Ecuador, Indonesia, Taiwan, Philipines). Then it’s easy to misunderstand or misinterpret specific concepts or instructions of the Mastery Program. For example, if I give you a flower, it is alive, it’s full of life, and you have to take care of it in a certain way. But when people grab that flower and squeeze it, the flower will die right there in their hands. Now to avoid this, we could use a plastic flower. Then we have a piece of plastic which we think is a flower. But then, without the subjectivity, we create just a look-a-like. So the challenge is in the transmission – the way the theory transmitted. So, therefore, we need the ST Evaluation program, where the team of ST Evaluators is there to help you find the real deal! In the transmission from the ‘map’ to the ‘territory’, there must be subjectivity, because if you have a plastic flower, it’s not going to blossom. So the way the concepts and instructions of the Mastery Program are transmitted is vital. And how you receive it, is also essential. And how you practice it, is also important. And the ST Evaluation brings those crucial dimensions into the process. Because if we just give you a bunch of instructions with only the Mastery Program, then it may become a very objectified Straightness Training if we use it to ‘score well on a test’. But that is like using an airplane as a carriage. ♦ 17. Can I request ‘free format’ coaching or receive Additional Coaching? We developed the ST Evaluation Program as the primary online coaching opportunity for ST Master students. And it’s a pitfall to see the ST Evaluation Program too much as a competition/examination/test instrument; it should be seen as an instrument for online lessons, and for checking if the combination of student and horse have created a stable enough platform and solid fundament to take the next step. However, we can understand that you might want additional online contact and coaching with an ST Evaluator or ST Instructor regarding one of your submitted and evaluated Touchstones. Therefore, we created the opportunity for “Additional Online Coaching”. And this service is an extension to the coaching you received through the Evaluation Program. The Additional Online Coaching is an extension to the coaching you received through the Evaluation Program. The basic input for this Additional Online Coaching will always be an evaluated Touchtone of yours, because the submitted Touchtone provides a visual reference and an Evaluation form from which you can start the Additional Online Coaching. The Additional Online Coaching can be used as input for your next Touchstone evaluation that you’d like to submit. You cannot use an unsubmitted Touchstone as a basis for the Additional Online Coaching in order to get a “promised pass” before you officially submit your Touchstone. You cannot use ‘free format’ footage (filmed or live broadcasted) as a basis for the Additional Online Coaching, because it will complicate the process, and it requires more preparation time and effort of the ST Instructor, which makes it unnecessarily expensive. With this ST Instructor of your choice, you can agree on when to do the Additional Online Coaching and how (Skype/Google Hangout/Telephone/mail). The expected cost will be comparable to the regular lesson rate of the ST Instructor. The price agreed upon is something that is between you and the ST Instructor. Also paying methods will be determined between you and the ST Instructor. Now we can totally understand your wish for smaller chunk where you want to submit a shorter video clip on one aspect of a certain Touchstone, but we have decided not to go down a path where students can submit snippets of a Touchstones. The first reason is, that the whole (sequence) is more than the sum of its parts (separate exercises) because every exercise benefits from the previous one and prepares for the next. That means, that an ‘error’ in the haunches-in can have its root in the circle. So we want to look at your work in a ‘compound’ way, not in an ‘isolated’ way, just to be able to see cause and effect. Besides this, we don’t want students to submit whatever they WANT, but we – as a team of ST Evaluators – are here to give them what they NEED – there is the real power of our evaluating system! So the Touchstone scripts are very well-thought-through and exactly how they have to be, and I am very proud to be achieving such great results with them for our students, and to have so many Grade 1, 2, 3 and very soon also Grade 4 graduates! ♦ 18. How long is a Touchstone (free/bought) valid? All Touchstones are valid for 12 months. 1. 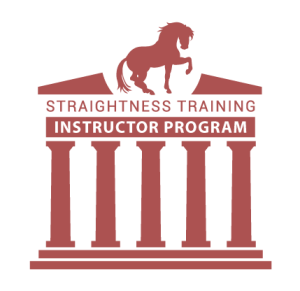 It’s our mission to get as many riders and horses to really start DOING Straightness Training with their horse, and to really increase their knowledge and to improve their skills, so they will be able to make their horses fit, healthy and happy. Therefore, it’s utmost important that people not only buy an ST course or program but actually start DOING something with the materials. And the Touchstones are a way to support and promote this. Therefore, Mastery students are encouraged to submit at least one Touchstone in the first three months after they started the program or course, just to get started and to create momentum in their ST journey. 2. The second reason is about the ‘perfectionism’ pitfall. A professional is able to do all five Grade 1 Touchstones within 6 to 8 weeks. However, beginner horse trainers have the tendency to stay in Groundwork Grade 1 forever because they think their work is not good enough. To avoid this, we encourage our students to see their Touchstones as lessons, where it’s better to submit five Groundwork Grade 1 lessons to breakthrough this Groundwork Grade 1 plateau than to have no lessons at all in the first year because of striving for perfection in Groundwork Grade 1. Remember: when you perceive the free touchstones as lessons, you don’t have to do everything ‘correctly’ or ‘perfectly’ at all. In fact, the value is just getting feedback for where you are at this time. The learning is going to come from the ST Evaluators instructions on how to make things better. So we encourage students to just submit a video of where the student is in his progress, and the evaluation will tell where s/he needs to go, how to stay on track, and most important of all: it helps to avoid creating ‘bad’ habits!! 3. Getting or buying a Touchstone also causes a sort of agreement between students and Evaluators. To be able to forecast the number of Touchstones we have to do each year it becomes unpredictable and unmanageable when the number of unused Touchstones starts to stack over the years. Touchstones are non-transferable and cannot be exchanged for cash. ♦19a. 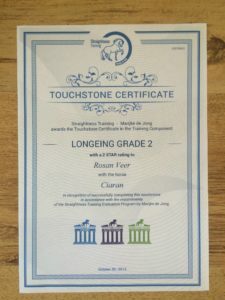 When my Touchstone is a pass, do I get a certificate? ♦19b. When my video has to be resubmit, do I lose my free Touchstone? If a Touchstone has to be redone and resubmitted, because you need to tweak and refine your work so you can help your horse in a better way, you have to use one of your other free Touchstones or buy an additional Touchstone. Or if you have used them all, you have to pay an additional fee for every additional Touchstone. ♦ 20. How many stars is required to continue? The stars and ratings are guidelines to access a particular skill, and they tell you how well you’ve learned it. With a 1-star performance it’s a wise strategy to, to perceive the Touchtone as a ‘lesson’, and to stay in the same pillar to integrate the tips you gained and to resubmit the same Touchstone in order to get a better fundament and create a solid base. Then you don’t use the stars for significance and ‘stripes’, but for growth and ‘measurement’ where you compare yourself to a standard and to your own progress and where you use the tips to close the gap between where you are and where you want and need to be. And this way you see the Touchstones as ‘lessons’ and not as ‘tests’ and that’s the real purpose and value of the ST Evaluation Program. You can also move on and focus on the next pillar within Grade 1. You will also gain more knowledge from working on all the pillars one at a time and then look back and see how far you have come. It is not about getting the highest possible ratings, stars, and grades, but finding out where you are, where you can go, and how to get there. And it’s mainly about creating a solid base and a stable enough platform so you can help your horse and make a positive difference in his development. You can submit the Grade 2 Touchstone within the same Pillar, even though you had a 1 star on Grade 1 level in the same Pillar. But your chances on a proper result in the second grade might be reduced because it could be that you have a not enough solid foundation in Grade 1. The key to real beauty and excellence lies in really mastering the fundamentals. Only when you have a solid foundation, then you will be able to build a real ‘cathedral’ that can stand the test of times. When receiving a one star, most students are happy and progress with the next challenge and Touchstone. But you will discover later on, that in order to reach higher levels, you need a foundation that is stronger than a one-star result. For example: If your haunches-in on the circle in walk is not really good, then that will haunt you in the canter pirouette until you decide to step over your ambitions and disappointments and go back to the basics in walk. That is why it is so important that in ST we put so much energy and focus on the basics. So actually when you fail to pass a Touchstone or when it’s ‘only’ a 1-star performance, that is actually the best value you can get for your efforts. Looking deeply inside, working with the feedback you got, grinding it out until it’s really a great foundation, that will produce the best way to real artistry. See also FAQ 29 in case you submitted your Touchstone before 1/1/2016. To qualify for the admission to the International ST Instructor Program you must possess good practical horse training skills and therefore you must have achieved the second grade with a two-star rating on average in all Training Pillars. ♦ 21. How can I join the ST Evaluation Facebook Group? Join the official Straightness Training (ST) Evaluation Facebook group for all members of ST Evaluation. In this exclusive group, you can post and view videos of graduates on different levels. It’s a place to inspire, support and motivate each other 24/7 on the wonderful journey of Straightness Training! It’s is a like-minded, positive and supportive community to assist you any time of the day to help you prepare your video’s, so you’ll never get stuck, and you always get quick answers to all your questions. If you use a nick name or your company name on Facebook, please send an email to [email protected] with your original name and your nick/company name, so we know it’s you. ♦ 22. Can I share my evaluations with other Mastery students? Yes, feel free to share your youtube link and/or feedback in the ST Evaluation Facebook Group, since we can all learn from each other and you could be an inspiration to others. And if you agreed to publication, your Evaluation might also be published in the membership area of this website. Due to the enormous amount of submitted and passed Touchstones between 2014 to the end of 2018 (over 2500 Touchstones). We made an appropriate selection in the Completed Touchstones library so as not to overwhelm Mastery students and to give them the best possible support in their preparation for a Touchstone. ♦ 23. Where can I find evaluations from my fellow Mastery Students? Go to the menu and hover over ‘Touchstones’. Next, use the search engine to search for a particular (type of) Touchstone. Only passed Touchstones can be visible. Only the Evaluation Forms of Mastery Students who agreed to publication can be published. Only a selection of completed Touchstones is visible due to the enormous amount of submitted and passed Touchstones between 2014 to the end of 2018 (over 2500 Touchstones). We made an appropriate selection in the Completed Touchstones library so as not to overwhelm Mastery students and to give them the best possible support in their preparation for a Touchstone. If there are no Completed Touchstones available in a certain Touchstone (Pillar & Grade), see FAQ ♦ 24 on how to prepare yourself. We have been practicing and experiencing with the Evaluation program for a few years now, since 2014, and after over 2500 submitted Touchstones it has grown from a simple ‘pilot try out’ in 2015/2016 to a mature and detailed program – version 2.0 – with certified evaluators, guidelines and lessons learned. In 2014, when we started the ST Evaluation Program, all Touchstones were defined by a certain set of exercises. So more modalities are defining each grade now. Therefore, to reach a really good overall standard In the ST community, we only present a set of Touchstones that meet those new definitions. See also FAQ 25. ♦ 24. Where can I find the ‘how to’ information? The ST Mastery Entry Course prepares you for the Groundwork 1 and Groundwork 2 Touchstone. The complete ST Mastery Program* gives you everything you need to progress through the entire ST Evaluation program, and contains all concepts you need and the exact ‘how-to’ information on all essential Training Pillars of Straightness Training: groundwork, longeing, work in hand, riding and liberty training. 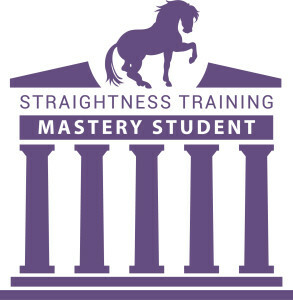 ST Mastery is the “Encyclopaedia of Straightness Training”. It consists of an extensive library of videos and documents, which covers every aspect and concept of Straightness Training. With this program, you can prepare yourself for all 5 Grades in all 5 Training Pillars. At this moment we have chosen not to publish example videos for each Touchstone. The reason for this is that we do not want students to put an effort in ‘imitating’ exercises or ‘copying’ a certain style of execution of a Touchstone. We want students to search for, and to work with the true essence of each exercise, and to become an original by developing a personal signature style of doing the Touchstones, according to the general guidelines. To think first, act later, and dive deeply into the ST Mastery Program. To put things into practice in your laboratory. To explore and gain experience from the inside-out by doing trial-and-error. To go through a learning curve with ups and downs while striving for constant and never-ending improvement with the help of an ST Instructor / ST Evaluator. This way you grow your knowledge and skills and create a personal style while developing towards the level of a true Master and authentic artist. On your personal path to Mastery, it’s important to receive feedback through submitting Touchstones and possibly Additional Touchstone Coaching and/or attending ST workshops. The ST Evaluation Program is positioned as an Online Learning Environment, NOT as a Competition or Examination environment. Therefore submitting a video with the intention to only “pass the test” is beside the point. Because if the purpose of (online) learning is to score well on a test, we’ve lost the real reason for learning. Therefore the Evaluations should mainly be perceived as lessons with invaluable information and feedback on how to improve and how to grow. Furthermore, inspiration and a display of diversity in the style of execution of the Touchstones can be obtained by studying the library of Completed Touchstones submitted by other ST Students. You can also watch the sequence videos in the ST Mastery portal – just type ‘sequence’ in the search box of portal to find these videos – and combined with the Completed Touchstones you’ll know what is to be expected in the Touchstones. *If you are interested in the full ST Mastery Program, just start with our FREE ST Mini Mastery course that consists of 4 in-dept training videos, so you’ll get an impression of what the ST Mastery Program is all about. ♦ 25. How does ST Evaluation 2.0. relate to ST Evaluation 1.0. – the Pilot Phase? We have been practicing and gaining experience with the Evaluation program since 2014 and after over 1250 submitted Touchstones it has grown from a simple ‘pilot try out’ to a mature and detailed program – version 2.0 – with certified evaluators, guidelines and lessons learned. The years of development has led to a balanced level and set of requirements that suit the ST community. When we started the ST Evaluation Program in 2014, all 5 Grades were defined by 5 Touchstones, and all 25 Touchstones were defined by a certain set of exercises – the standard 1.0. In 2016, we defined all 5 Grades not only in ‘exercises’, but we also defined each Grade in an ‘Overall level of skill’, a ‘Quality of skill set’ and a ‘Quality of the horse’s state’. So more modalities are defining each Grade now – which is the standard 2.0. On the ST Evaluation 2.0. website that exists since 2016, you can watch a video about the 2.0. ‘Grade Overview‘ and you can download the accompanying pdf where all Grades are explained according to the new modalities. The ST students who were pioneers in 2014 and 2015 and dared to start submitting Touchstones in the pilot phase of the ST Evaluation system didn’t have to deal with the crystallized, balanced and mature quality system and level that we are dealing with nowadays. These students had the benefit of the pioneering, but they also have the drawback that they now have to meet the new and tighter grade definition. When we look at history in general, in most sports disciplines the overall performance will increase the more people start to do it. So if more and more people begin to study and practice a certain discipline, the collective level goes up. As ST students will get better and better, they will automatically start to push each other up in an empowering way, because everybody can and will learn from each other. So we expect that within two or three years the quality of the ST Community will be even higher and we expect that new ST students will meet the accordingly improved standards to this level. The later a student joins the club, the more solid and mature things will be, but this also has benefits and downsides. As being a pioneer has its benefits and downsides. But whatever position you have, whenever you have started the ST Evaluation Program, you’ll learn loads of the valuable feedback, and it will help to grow as you go and to CANI as you try and you will benefit of the power and common growth of the ST Community. ♦ 26. How do I qualify for the ST Instructor Program? To qualify for the admission to the International ST Instructor Program, an ST Mastery Student must possess good practical horse training skills, and therefore the student must have achieved the second grade with a two-star rating in the ST Evaluation Program. This means that an ST Mastery student needs to have passed all Touchstones of the Training Pillars groundwork, longing, work in hand, riding, and liberty in the second grade with a two-star rating. Marijke de Jong will personally invite candidates who she thinks could be successful in helping horses and riders, growing the ST movement and running a prosperous ST practice for themselves. The ST Trainee Instructor should have a general talent to be able to develop up to grade 3 during the ST Instructor Program period. The ST Instructor program will take approximately one year to complete. The ST Instructor Program will consist of online courses and online classes to develop didactic skills and how to set up a teaching practice. The ST Instructor Program also includes practical personal one-on-one coaching by Marijke de Jong in real life to widen, deepen and broaden and to refine ST skills, and to achieve the minimum level that is required for ST Instructors: Grade 3. The ST Instructor Program will be done on individual basis, so it’s not a ‘group process’. Because each individual is different, so the amount of coaching and support may differ, a tailor-made offer will be made, once the student will be invited by Marijke de Jong personally. 1) Join the full Mastery Program. 2) Study the theory of the Mastery Program and start training your horse(s). 3) Submit Touchstones through the Evaluation Program. 4) Pass 5 Touchstones in grade 1 to graduate on the level of Grade 1. 5) Pass another 5 Touchstones to graduate at the level of Grade 2, with a 2-star average. 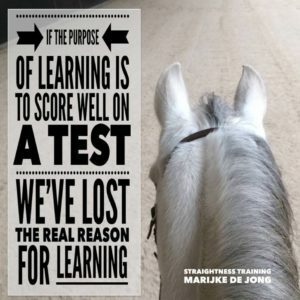 6) Marijke de Jong will personally invite candidates who are on the level of Grade 2 who she thinks could be successful in helping horses and riders, growing the ST movement and running a prosperous ST practice for themselves. ♦ 27. Is it possible to do touchstones on clinics instead of submitting online? In Straightness Training we have created an ‘online’ video evaluation system called the ST Evaluation Program and to be able to give online feedback to the video lessons we educated ST Evaluators. These online video lessons are given under supervision and responsibility of Marijke de Jong. ‘Offline’ our ST Instructors are able to give hands-on, one-on-one lessons in real life during ST workshops and clinics, and these lessons are given under the full responsibility of the particular ST Instructor. So the ‘online’ video evaluation procedure involves a thorough quality audit (QA) and supervision procedure, to make sure the general guidelines are met. Another part of the online procedure is that we log the progress of a Mastery student. This way we capture each touchstone in the system, so we can compare future touchstones with the touchstones that have already been submitted, also in the other pillars. This way we can monitor if former feedback has been understood and integrated and give the best advice possible to help the student to progress. 1. The great benefit of online video lessons is that you can both look at yourself from a distance, and at the same time you can see the Evaluator’s feedback. And you can watch and read it over and over again. This way, you will get much more out of a lesson. 2. The QA and supervision on this ‘live’ process cannot be done when the touchstone is performed live. 3. The touchstone can also not be logged since the lesson and feedback are not documented. 4. Therefore, we cannot monitor the progress of the student over time. 5. Besides this, doing touchstones live at a workshop or clinic might be more stressful, as it has to be done in front of an audience, in complete silence. 6. And when it’s a resubmit, this might be challenging to face in front of an audience. 7. Doing a touchstone ‘live’ also makes it impossible to make detailed notes, so only ratings can be made – as in competition dressage tests – there’s no time to add detailed tips and advice. Most scripts last 10-20 minutes, but an ST Evaluator normally takes at least triple that amount of minutes to evaluate and write down the feedback, because the evaluator will first watch and then write, this cannot be done at the same time. Now we are very much aware, that doing online video lessons and submitting touchstones can be a step out of the comfort zone. Because you need a camera, a filmer, a youtube channel, software to upload the video, etc. So it’s not an easy process, but already thousands of videos have been submitted, so it’s within reach, and it’s worth it to get the detailed feedback. ♦ 28. What if I don’t want to have my touchstone visible on a public YouTube video? 1. Put your video on ‘unlisted’ in YouTube. An unlisted video is a different type of private video. ‘Unlisted’ means that only people who know the link to the video can view it (such as friends or family or the ST Evaluation system to whom you send the link). An unlisted video will not appear in any of YouTube’s public spaces (such as search results, your channel, or the Browse page). 2. When you make the evaluation request on the home page of this website, make sure not to tick the box with the ‘Legal Disclaimer’. This way your video and evaluation form neither get published in the ST Community nor to the public. ♦ 29. What if I did my Touchstones before 1/1/2016? Can I update them to the 2.0 standard? If you passed your Touchstones before 1/1/2016, it has been evaluated according to the ‘old’ standard – the 1.0 standard. – Before 1/1/2016, all Touchstones were defined by a specific ‘set of exercises’ (1.0 standard). The quality of the horse’s mental state. So since 1/1/2016, more modalities are defining each Grade and Touchstone (2.0 standard). The level of excellence in Grade 5. A Masterpiece in Grade 5. And in each higher Grade the qualities of the lower Grades are integrated, so it’s about a ‘stacking’ of the Grade qualities. See the ‘Grade Overview’ document for more details. A 1-star performance, which means satisfactory, with the average of all exercises is rated between 5.5 and 6.4. A 2-star performance, which means fairly good, with the average of all exercises is rated between 6.5 and 7.4. A 3-star performance, which means good, with the average of all exercises rated between 7.5 and 8.4. A 4-star performance, which means very good, with the average of all exercises rated between 8.5 and 10. But the quality of star of a ‘before 1/1/2016’ performance doesn’t equal the quality of a star ‘after 1/1/2016’. You can UPGRADE your Touchstone by submitting a Touchstone in a higher Grade. For example, you passed your Liberty Grade 2 Touchstone in 2015, and now you continue with submitting your Liberty Grade 3 Touchstone in 2018. You can UPDATE your Touchstone which is according to the old standard, and submit the same Touchstone to have it evaluated according to the new standard. For example, you passed your Groundwork Grade 3 Touchstone in 2015, and now you submit the same touchstone, to have it evaluated according to the new standard. However, it’s recommended, that if you haven’t submitted any Touchstones in between the end of December 2015 until this year, that you UPDATE your Touchstone first, before you submit a Touchstone in a higher grade for an UPGRADE. © 2018 Straightness Training - Marijke de Jong & ThinkMarsman - All Rights Reserved.